Argonne biochemist Daniel Schabacker could be considered a Sherlock Holmes of bioterrorism. Although he doesn’t carry around a pipe and magnifying glass as he attempts to nab the culprit, he has a far more powerful deductive tool: the biochip. The biochip offers Schabacker and his colleagues at Loyola University (Ill.) a chance to determine the “signatures” of biological agents that can be used for bioterrorism, most notably the bacterium that causes anthrax, Bacillus anthracis. While some scientists have used DNA analysis to identify particular strains of the anthrax bacterium, the biochips help scientists and government officials to learn how anthrax bacteria are grown, narrowing the pool of potential suspects. This project, started only within the past couple of years, exemplifies the burgeoning field of microbial forensics. Because the anthrax bacterium’s proteins hold a unique and detailed record of how the cells were generated and handled, Schabacker believes that pursuing DNA and protein analyses in concert could yield a comprehensive database that identifies the conditions used to prepare almost any B. anthracis culture. Schabacker plans to leverage basic studies on the anthrax bacterium from the laboratory of Loyola professor Adam Driks to make biochips into a powerful tool for investigators and other scientists. Scientists obtain the anthrax proteins to create the biochip through a process called fractionation. Essentially, the scientists use chemicals to break open the anthrax bacterium and collect its cellular proteins. They then use another process to separate the individual proteins by their physiochemical properties. This process creates hundreds of separate protein fractions, which are then deposited onto a single biochip. Scientists then use different chemicals, or reagents, to characterize the resulting biochips just as a detective would dust for fingerprints. Just like a police interview with a suspect, this chemical process is known as “interrogation.” When a reagent interacts with a particular protein fraction, that spot will “light up,” creating part of the protein signature. Although the biochip technology has the potential to develop protein signatures of just about any biological agent, Schabacker and Driks have devoted their initial focus initially to B. anthracis. The spores produced by this bacterium, which cause anthrax, are relatively easily manufactured and dispersed, making the anthrax bacterium a relatively easily produced biological weapon. An expert on anthrax, Driks and his laboratory pioneered the forensic analysis of the spore coat of the bacterium. 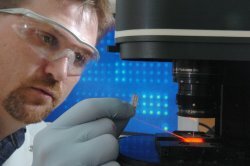 Schabacker combined the biochip technology with fractionation technology developed by Eprogen, Inc., providing a nexus that connects government research, academia and industry. Helping scientists track down terrorists isn’t the biochip’s only use. Biochips have already shown promise in diagnostic medicine. After developing the biochip technology, Schabacker licensed it to several companies, including Safeguard Biosciences in Toronto, Canada and Akonni Biosystems in Frederick, Maryland. Instead of looking at anthrax, Eprogen has put biochips to use to look for common cancer biomarkers. That research could open the door for doctors to create “antibody profiles” that could help them design individualized drugs or treatment programs for patients.